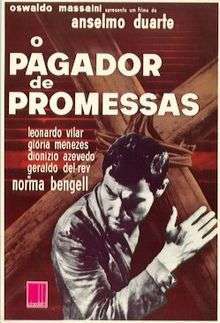 O Pagador de Promessas (Portuguese pronunciation: [u paɡaˈdoʁ dʒi pɾoˈmɛsɐs], Keeper of Promises) is a 1962 Brazilian drama film directed by Anselmo Duarte. Duarte adapted the screenplay himself from the famous stage play written by Dias Gomes. Shot in Salvador, Bahia, it stars Leonardo Villar. It won the Palme d'Or at the 1962 Cannes Film Festival, becoming the first (and to date the only) Brazilian film to achieve that feat. A year later, it also became the first Brazilian and South American film nominated for the Academy Award for Best Foreign Language Film. Zé do Burro (Leonardo Villar) is a landowner from Nordeste. His best friend is a donkey. When his donkey falls terminally ill, Zé promises to a Candomblé orisha, Iansan, that if his donkey recovers, he will give away his land to the poor and carry a cross all the way from his farm to the Saint Bárbara Church in Salvador, Bahia, where he will offer the cross to the local priest. Upon the recovery of his donkey, Zé leaves on his journey. The movie begins as Zé, followed by his wife Rosa (Glória Menezes), arrives outside the church. The local priest (Dionísio Azevedo) refuses to accept the cross once he hears about Zé's "pagan" pledge and the reasons behind it. Everyone attempts to manipulate the innocent and naïve Zé. The local Candomblé worshippers, for example, want to use him as a leader against the discrimination they suffer from the Roman Catholic Church. The sensationalist newspapers transform his promise to give away his land into a "communist" call for land reform (which still is a very controversial issue in Brazil). When Zé is shot by the police to prevent his way into the church, the Candomblé worshippers put his dead body on the cross and force their way into the church. 1 2 "O Pagador de Promessas" (in Portuguese). Cinemateca Brasileira. Retrieved June 6, 2014. ↑ The title translates literally as The Payer of Promises, but the film has been known by several other names in the Anglosphere, such as Keeper of Promises, The Given Word and The Promise. ↑ "Festival de Cannes: O Pagador de Promessas". festival-cannes.com. Retrieved 2009-02-23. ↑ "The 35th Academy Awards (1963) Nominees and Winners". oscars.org. Retrieved 2011-11-01. ↑ "Keeper of Promises". sffs.org. Retrieved December 11, 2014. This article is issued from Wikipedia - version of the 1/25/2016. The text is available under the Creative Commons Attribution/Share Alike but additional terms may apply for the media files.